The secrets of the 1,500-year-old Shaolin kung fu tradition taught by a 34th-generation Shaolin warrior monk. High above the bustling streets of New York City's hip Greenwich Village, Sifu Shi Yan Ming trains men and women of all ages, body types, and backgrounds in the fundamentals of kung fu. Hailing from China's Shaolin Temple -- the birthplace of Chan Buddhism and the mecca of all martial arts -- Yan Ming teaches the students at his U.S.A. Shaolin Temple that there is no better workout program than his brand of kung fu for getting the body and mind into warrior condition. Now this world-renowned master of the martial arts presents his 4-week program for total mind, body, and spirit transformation in The Shaolin Workout. This 28-day workout distills a lifetime of Shaolin training and wisdom into a manageable regimen, no matter your schedule, age, or fitness level. In as little as 15 minutes a day, you'll get an intense aerobic workout that increases your flexibility, power, and speed. At the same time you will experience spiritual benefits that will radiate through your entire life, allowing you to tackle the world with a Shaolin warrior's confidence, calm, and poise. 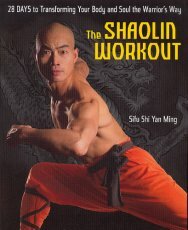 The Shaolin Workout includes 28 exercise sessions that teach authentic Shaolin kung fu stretches, stances, poses, punches, and kicks as well as daily meditations to strengthen the mind, body, and spirit. By following this program, you will become more in tune with your body and the world around you. The Shaolin secrets to getting the body, spirit -- and life -- you've always wanted are here in your hands. Now is the time to get started.